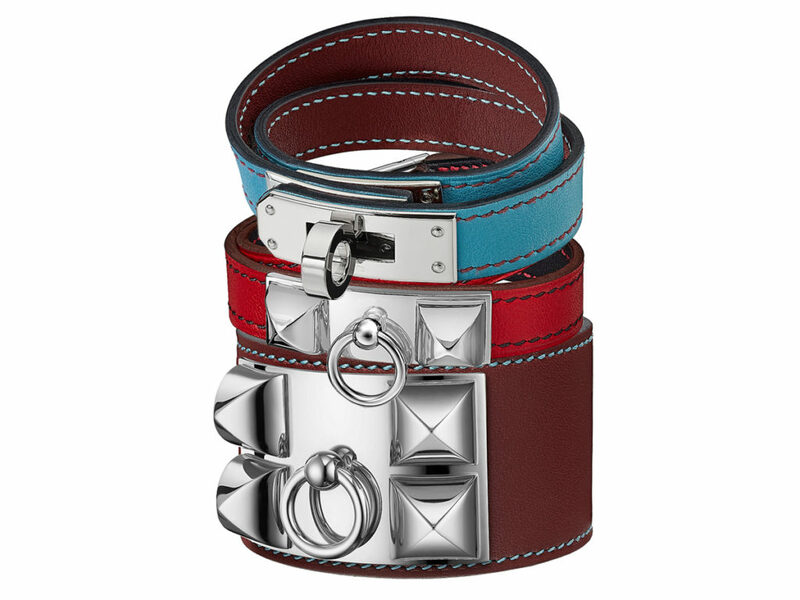 Major props to Hermès for giving fans plenty of options when it comes to its fashionable leather jewellery pieces. The Parisian luxury brand’s signature bracelets, for example, come in a variety of calfskin leathers (Epsom, Swift and Tadelakt, just to name a few) and exotics (alligator, ombre lizard and ostrich) that are finished with shiny hardware which typically come in four different variations like gold (GHW), palladium (PHW), Permabrass or rose gold (RGHW), leaving one truly spoilt for choice. Hermès is now turning it up a notch with the introduction of an all-new series known as Colorblock, which gives the bracelets dual contrasting colours on the exterior and the interior that are even finished with contrasting coloured seams for a truly standout piece. Currently, 3 popular pieces given the Colorblock treatment include the Kelly Double Tour (SGD770) in Bleu du Nord/Rouge H, which is a pop of blue and red that’s bold yet fun. If you’ve had enough of the twist-lock Kelly closure, you can opt for the Rivale Double Tour (SGD810) which comes with two Medor pyramid studs and a ring in the middle that’s perfect for the inner rebel in you. This piece comes in Rouge de Cœur/Bleu Indigo, a bright red laced with a dark shade of blue for that unique touch. Looking for even more studs? Then the Collier de Chien (SGD1700) is just the one, featuring a flip-side combination of the Kelly Double Tour, with a Rouge H exterior and Bleu du Nord interior. And because twin colour options are typically reserved for Hermès’ special-order bags, these bracelets will be coveted by collectors and fans alike and will be gone before you know it. In other words, shop now or regret later.